And what you see in the picture is not a black and white ball held by two sticks but rather a practical demonstration of the Casimir effect. 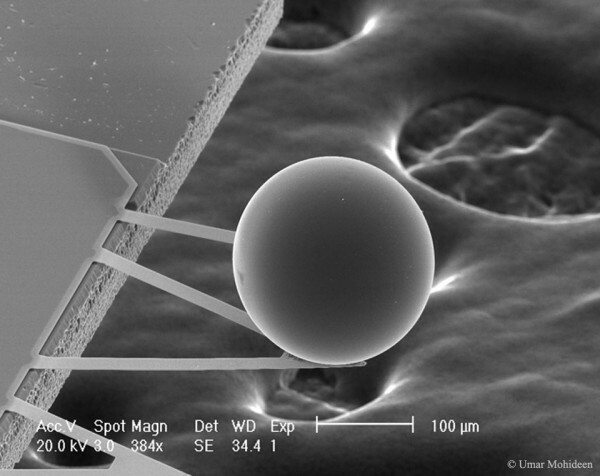 The Casimir Effect, named after its discoverer Hendrik Casimir 55 years ago is that a metal is able to change and create electromagnetic energy at very small distances. That is, the “nothing” creates forces. so small separation distances are the forces influencing quantum size effect and so this is within quantum field theory. And that has helped this effect? mainly because physicists to indicate that any type of field (obviously, all are electromagnetic) have a quantum origin (and not as a magic word). That is, they all have an origin from the smallest and what we see are the consequences of “many small” acting (which makes sense). The Casimir effect has been fundamental to the quantum theory of loops to have a tool (also mathematical) to see the vibration of the particles at fundamental levels and help to calculate these vibrations. In the picture, what is done to infinitesimal size is calculate as pellet and piece of metal in order to calculate the forces there involved (if quantum) are pushed because, as you know, in quantum all are waves and, separation enters the ball and the plate, the number of wavelengths that there is limited. Physicists that interests us and thanks to this effect helps us calculate the dark energy (the unseen) and is thought to be based on this effect to its creation in the separation of dark matter that creates forces that dark energy.